We sit by the banks of a limitless stream of information. At any moment, you or I can dip our virtual hands in and grasp insights and learning we never dreamt we’d have access to. If you don’t know what you’re doing, of course, you can repeatedly retrieve fistfuls of weed and dross – so some guidance on how to fish and filter is useful. Our panel for #LIKE69 at The Green in Clerkenwell helped us navigate the channels of Personal Learning Networks: we wanted to learn from their experiences of creating and maintaining learning networks and pick up some tips on selecting sources of trusted information. Elizabeth Charles, our host for the evening, is in charge of e-Services and Systems at Birkbeck, University of London. She’s hooked on lifelong learning and found the discussion forums attached to the various MOOCs she’s completed to be rich sources of personal learning. In common with the panel members, she’s a big fan of Twitter as a Personal Learning Network resource. Her colleague, and Birkbeck’s resident Learning Technologist, Leo Havemann, relies heavily on Twitter and follows a range of people who are his filters of useful information. He advised us to be smart in our use of Twitter – for example by making use of hashtags to filter and find what’s useful. Kate Arnold, Information Services Development Manager at The Francis Crick Institute, has been nurturing Professional Learning Networks for decades. She started by subscribing to professional Listserv services and, when she was at the BBC, making exchange visits with fellow media librarians at The Times, CNN and other organisations to learn about their ways of working. As well as professional networks and associations (such as LIKE and SLA ), she learns from others on Twitter. She told us it takes discipline and perseverance to create Personal Learning Networks. Her advice was to schedule time during the day to “indulge” in personal learning – Kate uses the journeys to and from work, and her lunchtime breaks to check in with her Personal Learning Network. And, she said, follow people from outside of your sector as well as those with similar interests. Adjoa Boateng, Head of Reference Services at The British Library, is another active Twitter user – one of her friends described her as a “professional lurker” – as she determinedly focuses on specific topics, follows and learns from proponents on Twitter and uses the gained knowledge as a springboard for further learning. She’s also active in person-to-person learning networks and started developing them when she first graduated and kept in touch with a small group of fellow graduates so they could continue to support one another. Adjoa draws on the practical advice of a Leadership Foundation learning set and casts her net even wider to pursue knowledge. Even when she can’t attend conferences, she’ll check out the programmes to glean what she can and, as a member of IFLA she took herself off to a conference in Puerto Rica where she learned about the networks of people she met and tapped in to an even wider Personal Learning Network. Adjoa reminded us of the importance of generosity – that to maintain successful learning networks you need to give as well as seek information. And, like Kate, she said it was essential to follow Twitter users from other sectors. She also advised us to follow some people we don’t agree with: you can learn a lot from discordant perspectives. Sarah Parry had been listening closely to the panel of speakers and told us that much of what they’d described aligned with the practice defined by John Stepper as Working Out Loud. In his Tedx talk, John Stepper described the evolution of STEMettes, an inspiring social enterprise that started with a straightforward ambition: to help combat the lack of women in STEM. It’s a great success story, and illustrates how much can be achieved when you put an idea into action that engages others. LIKE was just an idea a few years ago, and now it’s one of my most valued Personal Learning Networks. It’s a lot of fun too! It’s been my experience that only the most expert of practitioners can explain the basics of their discipline in simple terms. Where those who are less-than-expert blather and quote theory at you, the expert converses with you, sharing their personal knowledge in accessible language. Karen Drury is an expert Executive Coach, and at last week’s LIKE she provided us with an impressive and accessible introduction to Coaching. Cosmetic Listening: Familiar territory for nearly all of us! The kind of listening that engages your face and body (so the speakers feels you might be listening) while leaving the mind free to roam from shopping lists to planning the next hour or the next holiday. Engaged Listening: During which you actually listen, but with maybe half an ear – whilst preparing what you’re going to say when the speaker draws breath. Active Listening: These conversations progress quite slowly, because the listener is really listening and, when they speak, asks relevant questions – rather than making statements or offering unsolicited advice. Deep Listening: The intense level of focused listening that professional Coaches are capable of. This deep level of listening entails noticing not just what is said but the way it is expressed, the accompanying non-verbal signals and the thoughts behind the words. it’s skilled and difficult work, because the Coach is not simply a sounding-board, but a trusted guide – helping the person they’re coaching to investigate issues, examine options, decide on courses of action and find the resolution to act on those decisions. So the questions asked by a Coach must be carefully chosen and worded. Karen told us it was important to ask open questions (those which begin, for example, with ‘What’ or ‘How’), and very important to ask only one question at a time . And, she explained, a Coach should avoid beginning a question with “Why…..?”. “Why” questions are likely to throw those questioned onto the defensive – implying they should justify a decision or action. 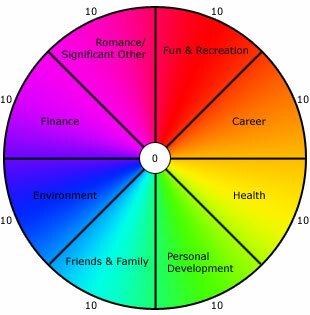 Karen then got us to examine the balance in our Life Wheels (similar to this one) where the outer rim was 10 out of 10 and the inner scores decreased to zero in the centre. When we’d all completed our wheels, Karen pointed out that it was as much an exercise in identifying how blessed one was, as it was in noting areas for attention. And she was right – we all had a number of high-scoring spokes near our wheel rims. But if we’d taken any of the wheels on the road, they’d have made juddering progress, as specific spokes, such as Self-image and Recreation/Fun, dipped toward the hub. So we paired up and, using our new awareness of active/deep listening, discussed with each other what could be done about these neglected areas of our lives. As Karen had predicted, being listened to in such a focused way was enough for some of us to diagnose the problem, examine optional actions and come to a resolution – while the listener barely uttered a word. It’s amazing what you can get done in the hour before dinner. Especially with the help of an empathic ear and an expert guide. In a professional landscape increasingly populated by vendor cheerleaders, one-trick product ponies and garrulous ‘gurus’, it’s refreshing to spend some time with LIKE professionals. 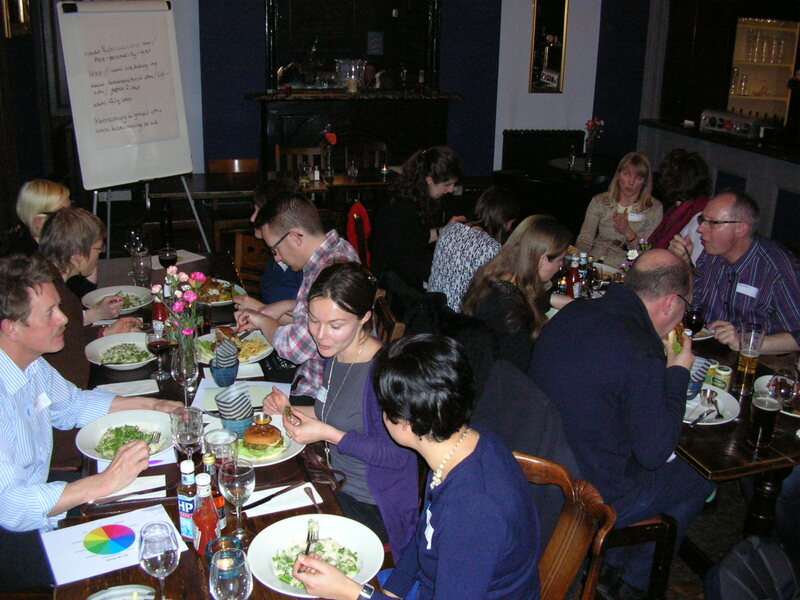 It was great to gather at our new home for dining and learning, the upstairs room of The Castle (just by Farringdon station), and explore the monumental task of creating a web archive. The debate was timely – a recent Economist article drew attention to the danger of cultural amnesia as contemporary record, in the form of web content, disappears in cyberspace. Dr Peter Webster is the British Library’s Engagement and Liaison Officer for the Web Archive. LIKE’s new dinner venue has the great luxury of a projection screen, so Peter was able to show us slides of some of the sites his team are capturing for posterity. These included the late Robin Cook’s website, and David Cameron’s 2005 election site. He told us about the “lost web” – sites that become victim of the disorderly disappearance of organisations and campaigns, and the “orphaned web” – sites that have served their purpose, and are abandoned. There was a nice example of a formerly lovingly-tended site dedicated to Charles Darwin’s house, not updated since 2006 because English Heritage had taken custody of the house and, in turn, its online representation. Since 2004 the Web Archive team have fulfilled their brief, of archiving websites of cultural and scholarly importance from the UK domain, by capturing 11,000 sites (16 terrabytes worth). They are collaborating with other libraries, archives and collectors to get the job done, but it’s still a daunting task. Automated domain harvesting helps, and there are collections we can all agree future historians will be glad to have: the Credit Crunch, the Jubilee, the Olympics…….. However, at this stage, predicting the exponential growth of the archive, and how easy it will be to browse is challenging to say the least. Some questions are very hard to answer: how do you decide what is published in the UK? The URL doesn’t necessarily give you a clue. How do you find the owners of content to verify copyright? What are the full implications of the non-print Legal Deposit Regulations? As the discussion continued, I was very glad not to have Peter Webster’s job! But I was delighted he’s doing it, and that he and other historians and archivists are on the case. It would be horrendous if our collective neglect caused late 20th and early 21st Century culture to become a growing black historical hole. I say collective neglect because Peter made it clear that the content our organisations are generating now will be of importance to historians in the future. So his message, to all of us, was plan your digital archiving strategy. And if you want to nominate a website for inclusion in the archive – do it.